However well it served its purposes, it was an accurate but somewhat awkward-sounding catch phrase, as I would come to learn firsthand when I was stationed with the United States Foreign Service in Jamaica at an earlier stage of my professional career. At that time, I served as a cultural-affairs officer at the U.S. Embassy in Kingston, the tiny country’s funky, traffic-congested capital on the island’s south coast. During that period, I became deeply involved with Jamaica’s vibrant arts community and, over the years, in conjunction with routine return visits, I have been able to do on-location research here and write about numerous Jamaican artists. Now, a new exhibition, In Retrospect: 40 Years of the National Gallery of Jamaica, currently on view (through November 15) at the Kingston museum to which its title refers, places in sharp focus the accomplishments of many of those artists. For art lovers who happen to be passing through Jamaica, it is a well-assembled, aesthetically rich presentation that should not be missed. Jamaica’s cultural and social complexity — not to mention the political-economic challenges it routinely has faced — has long distinguished this small country. A former British colony, which gained independence in 1962 and has since been deeply influenced — some Jamaicans would say overwhelmed or manipulated — by the U.S. and Uncle Sam’s pals at the International Monetary Fund (see Stephanie Black’s 2001 docu-film, Life and Debt). Jamaica, like Cuba, offers a vivid microcosm of the multi-layered cultural, linguistic, colonial and post-colonial New World experience that may be observed in more spectacular relief in such larger countries as Mexico or Brazil. It is this cultural-historical background and the search for ways to express its national identity that have characterized the Jamaican story, especially in the period leading up to, and in the decades immediately following, independence. In 1974, the National Gallery of Jamaica was established in Kingston. The new museum’s mission was in part to assemble a permanent collection of works made by Jamaican artists, one that would comprehensively recount and reflect the local evolution of the visual arts. Implicitly, if not also explicitly, such a collection and the scholarship, exhibitions and curatorial expertise supporting it would help shape a sense of national identity (which, in time, they did). Modern Jamaica is and always was more than reggae music, ganja-growing and beach resorts, as its old ad slogan rightly suggested. 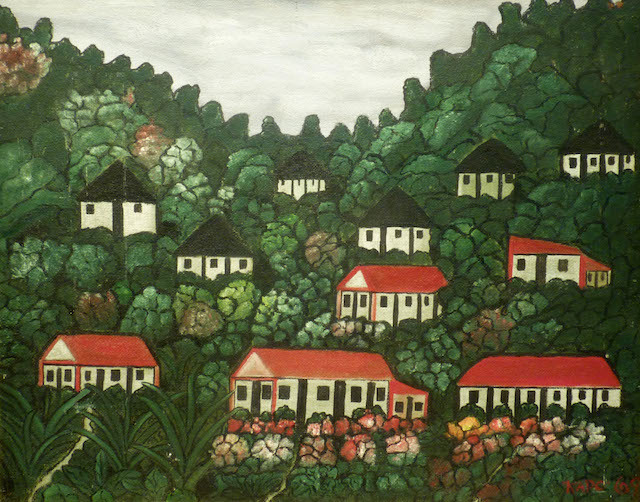 Its story was also that of a growing middle class, of political-leadership efforts in the Caribbean region and of home-grown and indigenous art forms that defied familiar, often limiting classification labels “from foreign,” as the Jamaicans would say, meaning “from overseas.” Over the decades, in paintings, sculptures and other works, Jamaica’s academically trained artists and its folk or self-taught art-makers have depicted subjects that have been indelibly linked to their homeland: village and urban scenes; rural, African-derived obeah (folk magic) practices; and the impact of modern consumer culture on a society that was once primarily agrarian, its colonial-era plantations powered by slave labor. Not long after the National Gallery of Jamaica opened to the public, the young Jamaican art historian David Boxer, who had earned degrees in the U.S., from Cornell and Johns Hopkins, became the new museum’s director. 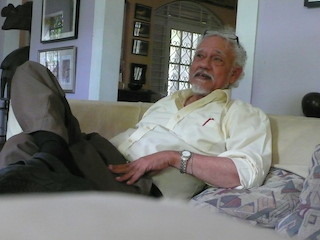 He went on to serve nearly four decades in that role and/or in the role of chief curator. Boxer was also a working artist in his own right, who, in his twenties, had boldly written to the painter Francis Bacon in England — and, to his astonishment, received a personal response. Eventually he would meet the modernist master and assimilate some lasting influences from him into his own work. Boxer is often credited with having introduced the mixed-media installation form to Jamaica’s contemporary-art landscape; his own installations, packed with local and regional historical references, are marked by a poetic-surreal air, but they have taken on some big themes, including slavery. In Retrospect offers a summary of Jamaican art’s evolution since the founding of the NGJ, which began with a first, big acquisition of 262 paintings and sculptures from the Institute of Jamaica, the museum’s government-sponsored, parent institution. At the same time, it recalls the NGJ’s role as the nation’s official art-history storyteller in its canonical analysis, documentation, codification and presentation of those decades of local art history and the broader, formative period that preceded it. Boxer’s curatorial decisions over the years significantly shaped that official narrative. 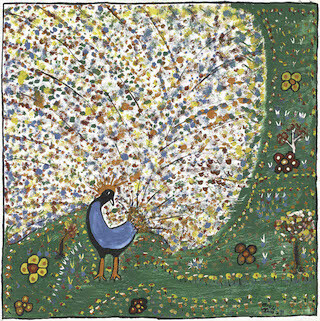 One of his most influential actions was to pay scholarly respect to the work of the island’s most accomplished self-taught or outsider artists, most of whom had received little or no formal education and no art training. 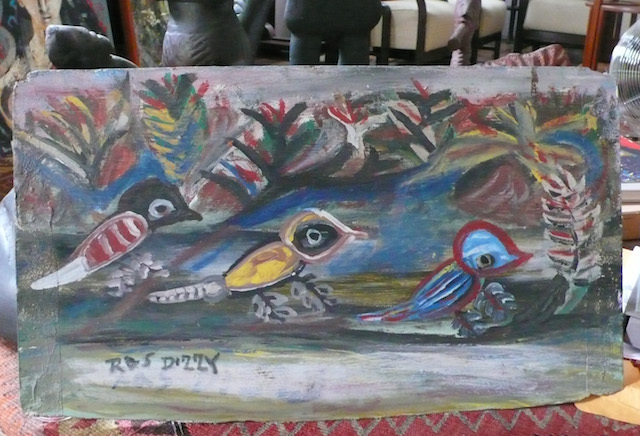 Boxer dubbed them the “Jamaican Intuitives,” a label that stuck to, among others, John Dunkley (1891-1947), a conjurer of mysterious, fecund, nocturnal images; Mallica “Kapo” Reynolds (1911-1989), a maker of paintings and carvings of country scenes and characters; Allan “Zion” Johnson (1930-2001), a painter of Bible-related images featuring strange, Kremlin-like onion domes; and Ras Dizzy (circa 1932-2008), an itinerant poet (his given name was “Birth Livingstone”) and maker of poster paint-on-illustration board depictions of horse races, palm trees, prizefighters, cowboys and fortune tellers. 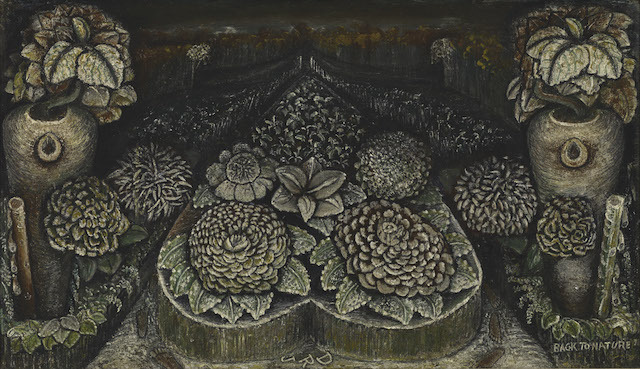 Some schooled Jamaican modern artists resented Boxer’s emphasis on the work of self-taught art-makers and questioned their prominent inclusion in the nation’s emerging, art-historical canon. Poupeye and her curatorial team have divided In Retrospect into several thematic and chronological sections. Each one examines a different period in the NGJ’s history and the critical issues that percolated within the museum, in artists’ studios and in the broader Jamaican-Caribbean art world during those past times. 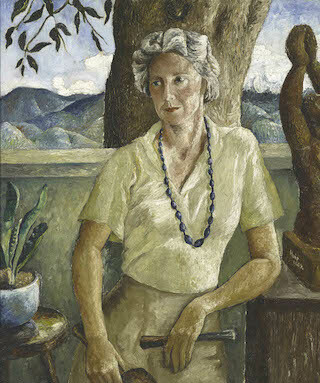 Works like Albert Huie’s 1940 portrait of Edna Manley (a sculptor, Manley was also the wife of Jamaica’s pre-independence chief minister, Norman Manley, and the key figure in the genesis of modernist art-making in the country) or Barrington Watson’s oil-on-canvas “Mother and Child” (1958), show how trained local artists brought into their work the lessons of Impressionist brush-handling and modern art’s preference for a more detached, non-sentimental approach to traditional subjects. 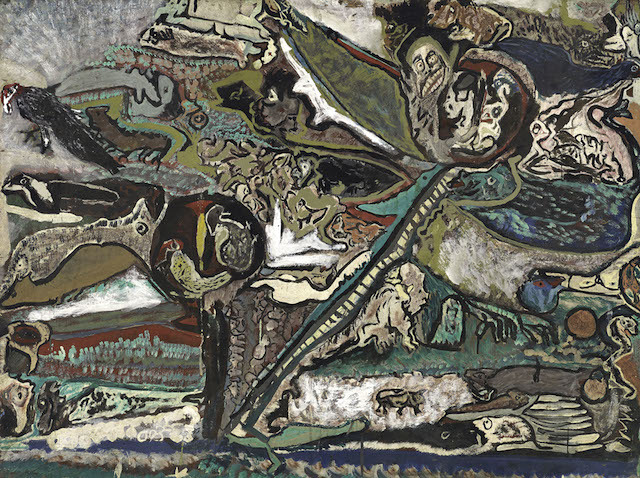 Similarly, a large painting like Eugene Hyde’s “Colonization II” (1960) offers evidence of how some Jamaican modernists adapted the language of abstraction to their thematic interests. 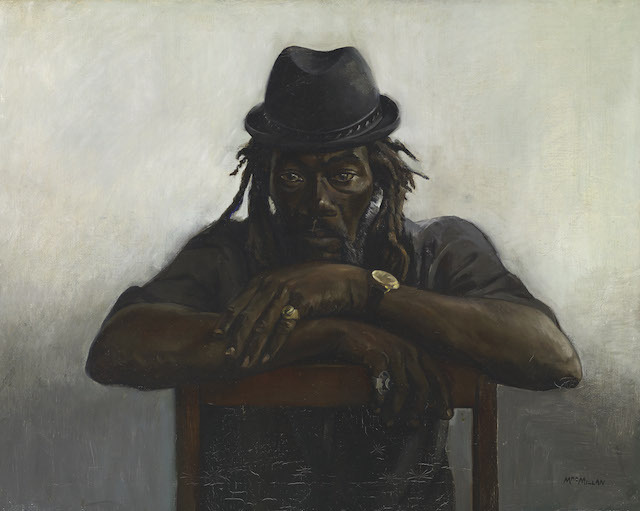 The eloquent, small-format portrait in oil, “Ras Dizzy” (1974), by the painter Judy Ann MacMillan, catches the vagabond Rastafarian poet-artist in a moment of repose. It quietly suggests that, for all their eccentricities, characters like Dizzy, who told outlandish tales of fighting Cassius Clay and riding tall in the saddle with John Wayne, were important figures in Jamaica’s cultural life, worthy of enduring recognition in its pantheon of cultural heroes. In Retrospect also features works by Jamaica’s youngest generation of artists, many of whom have studied overseas and brought back postmodernist ideas about recontextualizing appropriated imagery and found objects. Often a poetic-political current can be felt in their work. 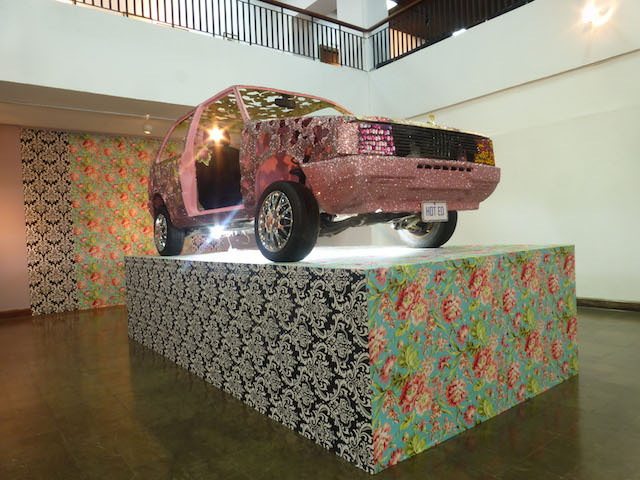 An example is Ebony G. Patterson’s “Cultural Soliloquy (Cultural Object Revisited),” a 2010 installation that includes a real auto chassis and body, pimped-up with colorful fabric, glitter and rhinestones, a symbol of media-influenced Jamaicans’ yearning for gaudy, American-style bling. 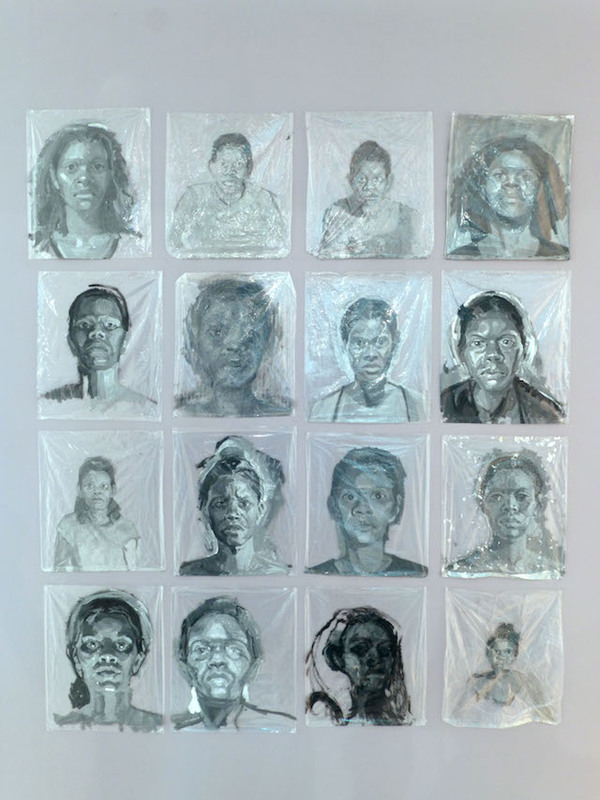 Another is Camille Chedda’s “Shelf Lives” (2011), a series of modest but powerful portraits of ordinary people rendered in mostly gray acrylic paint on clear-plastic storage bags, throwaway symbols of what, to many political and corporate leaders, are probably insignificant, throwaway lives. “It’s remarkable how much talent there is in this small country and how rich the artists’ ideas are and always have been,” Poupeye said. Similarly, given the perennial struggles with limited budgets and administrative crises that the NGJ has faced, the world-class quality of the more than 100 exhibitions it has presented since its inception and of the scholarship that has supported them have been impressive. Moreover, just as some Jamaican contemporary works have forthrightly addressed certain social-political themes, over the years the NGJ’s administrators have managed to hold their ground against censorship. Given the museum’s status as a government-funded institution, they have also prevented its programming from becoming politicized by any self-serving governmental powers. In recent years, Jamaica’s tourism-promotion slogan had been “Jamaica: Once you go, you know.” Since late last year, though, the official line has become the obscure-sounding “Jamaica: Get all right,” which the tourist board introduced to the New York media market last November by rolling into Times Square a gigantic yellow stress ball, imprinted with the new slogan and a humongous smiley face. Alas, that silly stunt just served to remind Jamaicans and more sensitive travelers to their country that now more than ever, half a century after independence, Jamaica is not just a beach in America’s “backyard.” It’s a complicated, sometimes confounding place, with a rich culture and multifaceted, multicultural society, of which an exhibition like In Retrospect provides ample, compelling evidence. In Retrospect: 40 Years of the National Gallery of Jamaica continues at the National Gallery of Jamaica, in Kingston, through November 15.